Home / Department • Faculty • Students / Jeremy Caldera receives the 2015 Young AV Professional Award – Nurtures L&IS Student Successes – Featured in “Commercial Integrator”! Update: Jeremy and his “Audio Visual System Design” course are featured in the latest issue of “Commercial Integrator.” Congratulations Jeremy! 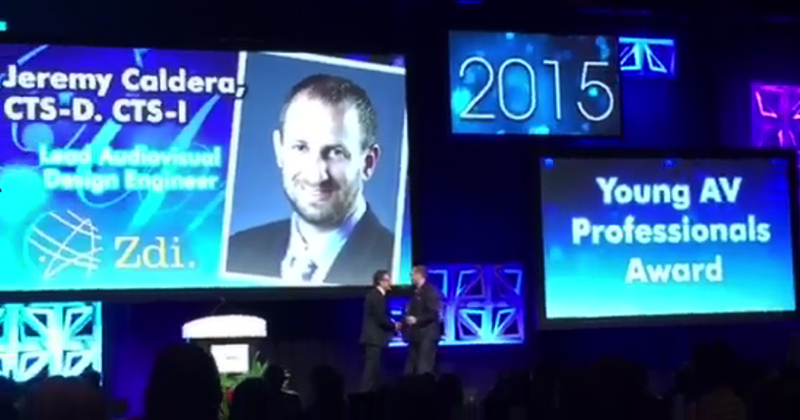 AA&A adjunct Instructor, Jeremy Caldera CTS-D CTS-I, received the 2015 Young AV Professional Award during InfoComm’s 2015 annual meeting in Orlando, Florida, June 13-19, 2015. Jeremy is Lead Audiovisual Design Engineer at Zeller Digital Innovations (Zdi Inc.) and teaches our AV System Design course, which he co-designed with Assistant Prof. David McNutt, MBA. 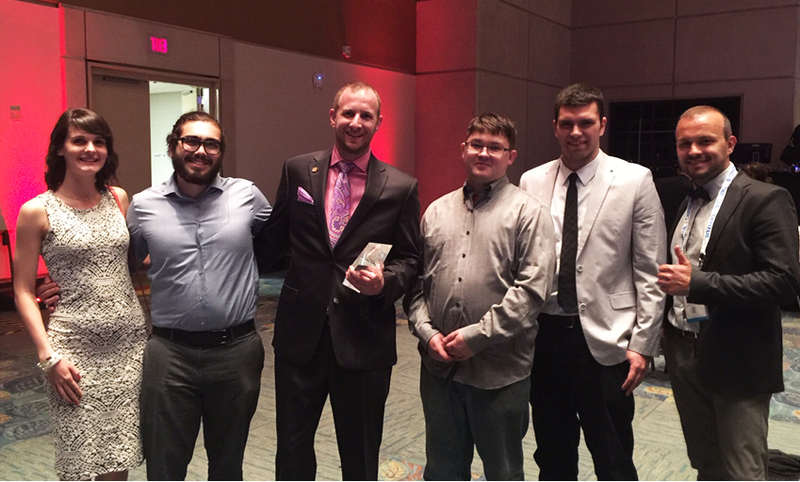 Zdi Inc. sponsored participation to the award dinner of 6 AA&A students (5 from the Spring 2015 AV System Design class) who joined Jeremy and David for InfoComm’s 2015 annual meeting. Under the faculty’s mentorship, students had the opportunity to explore the exhibits and special events in depth, as well as have a on-on-one meeting with InfoComm CEO, Dave Labuskes! Jeremy and Zdi Inc. also sponsored the successful candidacy of Live & Installed Sound (L&IS) senior Stanton Helms for the International Communications Industries Foundation (ICIF) Grant. In addition to receiving a financial award towards tuition costs, Stanton will be gaining valuable industry experience as a Zdi Inc. employee over the current academic year. Finally, one of Jeremy’s Spring 2015 students, L&IS senior Victoria Barela, was the only student to make it to Systems Contractor News‘ 2015 Class of the Nine! We offer our sincere congratulations to Stanton, Victoria and to the rest of our students for the recognitions they earned and for their successful participation at InfoComm 2015, and our deep gratitude to Jeremy, Zdi Inc., InfoComm, and ICIF for helping us nurture our students into successful professionals! following the 2015 InfoComm Awards ceremony.